Looking for advance fares on February 2021 Florida flights? We have prices for Virgin, Norwegian, British Airways and United. We also have great rates on car-hire and Florida accommodation. Telephone us on 01934 319 851 for an instant quote. Early February – if you can depart in the first week of February, fares are very reasonable. Fly direct to Orlando from Manchester or Gatwick. Mid-February – fares are a little higher, but still decent value – particularly if you avoid the weekends. February school holiday – we think Friday 12th and Saturday 13th February 2021 will be the busiest departure dates. If you need half-term 2021 Florida flights on these dates, book in advance. Late February – prices drop once the half-term holiday is over. The last few days of February are excellent value. Don’t fly on the weekends. Mid-week departures (especially Tuesday and Wednesday) are cheaper. Book in advance. The earlier you book, the more time we have to find a bargain. Once flights are released we check fares daily and book your seats at the best price. How much do you expect to pay for Florida flights February 2021? Don’t be surprised to see fares exceeding £600 per person. If you follow our advice, you could slash this price and achieve fares around £425 per adult and £350 per child. Heathrow’s indirect Florida flights are an excellent option on peak dates. They might be worth considering on the busy half-term weekend. Otherwise, direct flights from Gatwick or Manchester are great value throughout the month. Only Gatwick and Manchester offer direct Florida flights throughout February. If you’d rather depart from your local airport we book connecting flights for a supplement. Schedules are typically convenient and your luggage will be checked through to your final destination. Fly from Jersey, Isle of Man, Newquay, Exeter, Inverness, Aberdeen, Glasgow, Edinburgh, Belfast and more. For further information, complete our online enquiry form or call us on 01934 319 851. Flying can be stressful. For peace of mind, we only book with reputable airlines, including BA, Virgin, Norwegian and United. Our prices are low because we check fares daily and book at the best moment. To take advantage, book in advance now. If you’re planning a theme-park holiday, Orlando International is the most convenient arrival airport. Tampa and Fort Myers are handy if you want to stay on the Gulf Coast. Miami is ideal for holidaymakers planning to visit the Keys or the Everglades. Combine your February 2021 Orlando flights with car hire and accommodation for the complete package. We offer an excellent range of accommodation at an economical price. We can even save you money on Disney and Universal tickets. For a complete quote, complete our enquiry form or telephone 01934 319 851. Book your February 2021 Florida flights in advance now with a deposit of £100 per person. Remember – the sooner you book, the more time we have to find you a bargain. For more information or an instant quote, call us on 01934 319 851. All our February 2021 Florida flights and holidays are ABTA and ATOL protected. Swap the miserable UK weather for some Orlando sunshine with this February 2021 Florida holiday. 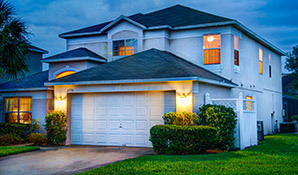 Fly direct to Orlando, pick up your hire car and drive to your luxury Emerald Island villa. The location is wonderful. Disney is 3 miles away, Universal is a 20-minute drive. It's perfect for families looking to enjoy Florida's top attractions and theme parks.